Learn how to make your very own Ice Cream Rolls! This is a 90 minute 'All You Can Eat' experience. Located in the heart of Downtown Los Angeles fashion district, in Chillbachi's intimate tasting kitchen. Our chef will show you the proper techniques to prepare you for creating your very own curly creations. 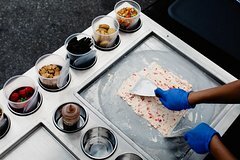 You get to pick out your toppings and flavors, and create your very own custom ice cream rolls. It is a lot of fun and you get to share it with others, so everyone in the class gets to try lots of flavors. This experience takes place at 1040 S. Los Angeles St. #14, Los Angeles CA 90015 in Chillbachi's Tasting kitchen. We offer various start times for our classes throughout the day, so please schedule with us as spaces are limited. When you arrive you are treated to a fun demonstration by our professional ice cream rolling chef where you learn all the tricks to making "Nice Rolls". Then you sample delicious ice cream, until it is your turn to get up, and start picking out your own toppings and flavors for your rolls. We do our best to accommodate for people with dietary restrictions, including non-severe food allergies. We also carry vegan based ice cream for those who wish. We encourage you to have fun, take pictures, interact with others in the class and most importantly, have delicious ice cream.